Andrew Stone (aka twittelator) mentioned making curried lentils and potatoes on a Twitter posting on New Year's Day 2009. Inspired by that we made this and it was good. Put broth and dried lentils into a large pot over high to medium heat. Saute the onions and garlic in oil till golden. If adding cumin/curry, stir cumin and curry into the onions and cook a minute or two more. Stir onion mixture into the lentils. Saute the carrots and celery in generous amount of olive oil till just tender. Set aside. 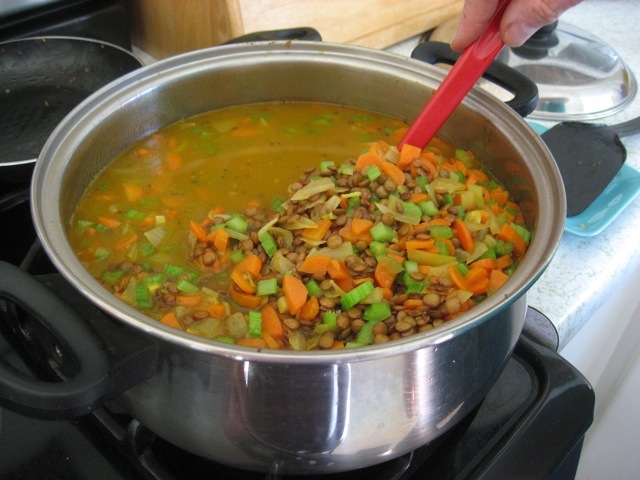 After lentils come to a full boil, reduce to simmer and simmer till lentils are tender. This will take anywhere from 1/2 hour to several hours depending on the type of lentils and the altitude. (Brown lentils in mile-high Albuquerque take us about 1-1/2 hours.) You will likely need to add additional water to lentils while they are cooking. Spoon into bowls and add a dollup of yoghurt to each bowl. Add diced potatoes along with the carrots and celery (per Andrew). Add 2 T. sauteed black mustard seeds (per Andrew). Add sauteed cumin seeds (per Andrew). Use lots more olive oil, up to 1 cup (per Andrew).